As we travel around the city (and even outside of it) during our DigitAll stops, we get asked a lot of different questions about tech and digital devices. While there are typical questions we know to expect, one topic that seems to be growing in popularity is wearables- more specifically, fitness trackers. While we do our best to answer your questions, we realised that there was actually a lot that we didn’t know about these popular little devices and so it was time for us to do a little experimenting and put one to the test. Step in Mary, our Marketing and Comms Assistant/ Fitness Tracker guinea pig. So, first things first, what exactly are fitness trackers? Fitness trackers are wearables (technology that can be worn on the wrist and can connect with other devices such as phones whilst having their own functions) that are used to monitor things such as steps, heart-rate and sleeping patterns. While the categories measured will depend on the brand and model of the fitness tracker, pedometer (step counter) and heart-rate seem to be the standard. Popular fitness trackers include Fitbits and Garmins. For our experiment, we chose a fitness tracker under £30 but one that still covered a lot of bases including steps, heart-rate, calories, mileage, activity duration and sleep. The first challenge was setting it up. While there was an initial bit of confusion as to how to charge it, we soon realised that we needed to take off the bands and plug the device itself (the ‘body’ of the watch) into a usb port. After that, it was easy enough to find the partnering app on Mary’s phone and connect the device to it. As you set up the app, it may ask you to fill in information such as height and weight as well as prompt you to set a daily step target. While the suggested is 10,000 steps (likely thanks to the popular belief that people should walk 10,000 steps a day) she set it at 6,000 at first and then 7,000 once she had a better idea of her average step count. While the band felt a little awkward at first, she soon felt comfortable wearing it and was able to watch her progress as she moved around. 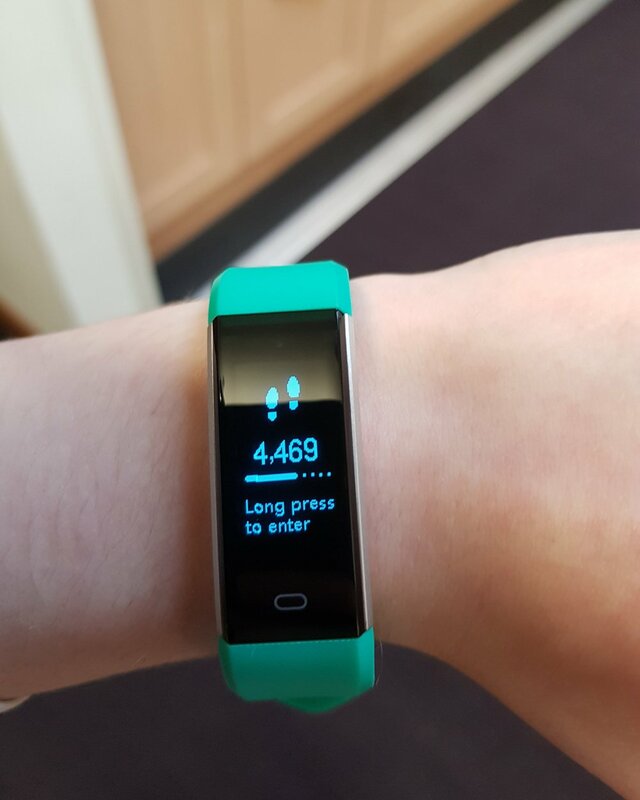 To get an overall idea of what someone might expect from the fitness tracker, Mary wore it for a few typical days at work- making sure to walk around the office as usual with the occasional burst of high activity thrown in. The tracker was fairly accurate in recognising steps and counting during faster paces of walking, such as a quick jog or climbing the many steps at Wavemaker HQ. However, while the tracker was good at marking up steps, that’s not to say that it didn’t have some misfires. Fitness trackers work out steps via motion and use that as an indicator of the wearer’s activity. This meant that, occasionally, the tracker would be confused by certain movements that didn’t come with steps such as rolling over or, shockingly, unravelling knitting! The sleep function came up next. After a couple of nights of testing, Mary was pleasantly surprised by how accurate the tracker was. It was interesting to see that this particular app recognised light sleep from deep sleep and was able to give an overall picture as to how much productive rest she was getting. The heart-rate function was also interesting. While it was good to get an overall idea of her BPM (beats per minute) and how it went up and down throughout the day, this particular model showed a rapid transition between readings over a short space of time, something which could be seen through the app and the graph plotting the rise and falls throughout the day. This particular model had call and text functions, something that was particular useful as Mary was wandering around HQ trying to earn those precious steps to hit the day’s goal, and allowed her to know that she needed to check her phone- a function that is helpful for any runners or gym-users who are looking to invest in a tracker to monitor their progress. Speaking of trying to earn those important steps, that nicely brings us to motivation and one of the many benefits of the fitness tracker. Mary found herself willing to move around a bit more and incorporate extra exercise into her day, whether it was choosing to get off the bus one stop earlier or deciding to take the stairs a few more times, the tracker was a silent encouragement to keep moving. When you do meet your goal, the tracker buzzes and a fun little animation flashes up to let you know you’ve succeeded. (Mary tried to capture this but was too busy celebrating her step count). So, overall, is it worth it? What did we learn about fitness trackers? While it’s important to keep in mind that there are many variations of models, each offering its own functions and capabilities, as a whole we found them to be a useful little gadget for people who are trying to be more conscious about how much they move throughout the day. That’s not to say that they come without certain problems- Mary found numerous cases where the tracker didn’t seem to capture her heart-rate or movement properly but as a device that encouraged her to move more, she found it did the job well. We asked her what her final thoughts were. Set a reasonable starting point. The normal suggested number of steps is 10,000 but start by working out your average daily step count and then set your goal slightly higher. As you get more confident, you can start to build your target. Don’t jump into running! If you’re using the fitness tracker as part of a new exercise regime, make sure to ease yourself into it to avoid injury. Apps like Couch to 5K can ease you into running and can work alongside your exercise plan. It’s important to consult your GP before starting any major exercise regimes to make sure that it is safe for you to do so. Remember that you can choose how much of the fitness tracker you want to use- there’s no rule to say that you have to wear it 24/7, though a lot of people do choose to. The device needs to work for you. Remember that it is a guide. Everything that the fitness tracker shows you is an estimate so there may be no reason to panic if things like heart-rate are shown to fluctuate drastically over a few seconds. Of course, if you have any concerns, make sure to speak to your GP. Make sure you know how to charge it! Some devices will need to be plugged into a USB port, so make sure that the fitness tracker you order either comes with a cable or that have a port you can use. Check the product description, speak to someone with the same model or ask the product supplier if you aren’t sure. Don’t forget to stop by one of our DigitAll stops with any other questions that you might have about fitness trackers or other any other bits of technology! If you have any questions about our experiment or want to know more, make sure to get in touch, either by visiting us at one of our mobile digital classroom sessions (follow us on social media to find out when we’ll be near you) or by getting in touch via the contact us page.